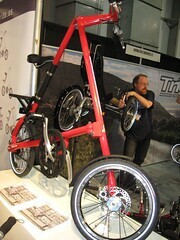 I have to admit that when I first saw the Strida folding bikes I wasn’t all that impressed. It looks somewhat like Sinclair’s “A Bike” and I assumed the Strida bikes would have the same performance characteristics as the Sinclair. I tried the Strida 3.2 and 5.0 briefly on the show floor at Interbike and I was impressed. These things are actually fairly ridable and fold quickly and compactly. While Treehugger and other sites give the Strida a quick mention, here’s a review from somebody who actually uses the Strida on his daily commute. The Strida bike is essentially three tubes of aluminum with saddle, handlebars, wheels and pedals attached. The 22 lb Strida 3.2 features maintenance-free everything: drum brakes, grease-free belt drive, plastic wheels, plastic hubs and plastic bottom bracket. With the 5.0 model, Strida improved the quality and reduced weight to 19.4 lbs with disc brakes, anodized alloy wheels, somewhat better cranks and chainring, and alloy hubs and bottom bracket. Both models are single speed. During my very short test rides on smooth surfaces, the Strida bikes rolled just fine. The 56 inch single speed means this bike is suitable for short rides on level terrain — I see the Strida as the perfect complement to a multi-modal commute where most of the distance is covered by train or bus. Folding bikes can fold very compactly for carrying onto a bus or train, but the folding process can take half a minute or so as various latches are released and re-attached. The Strida bike, on the other hand, can be folded in under 10 seconds with its hinge and magnetic latch. Since I often get to the bus or train within seconds of its departure, this quick fold capability is very handy. Fenders/mudguards, a tiny rack, folding pedals, folding handlebar and carry bag are available as extra add-ons. Because of the unique A frame design, it’s basically impossible for women (or men) in skirts to ride the Strida. Areaware of New York City is the USA distributor of Strida bikes. While USA dealers are few, Areaware is expanding the Strida dealer network. In the meantime, the bikes can be purchased online. Strida UK offers a 60 day risk free trial! A very detailed review of the Strida 3 is available at the Folding Society website. This review also includes feedback and commentary from Mark Sanders, the designer of the Strida. Sanders primarily addresses concerns with using a belt drive and riding position, along with interesting trivia about Strida manufacture and sales in the Far East. What do you figure would be the weight of the Strida 3 with mudguards & the optional carry rack included? In a top 5 list of the lightest production model folding bikes, I listed the Strida 3 at 22 lbs incl the mudguards. Now, I’m wondering if I was in error. Larry, I don’t know. The bikes I tried were the “performance package” with all the extra stuff. They were very light bikes! Is it your site that had the video comparing the Sinclair A with the Strida? I saw a video somewhere comparing the two but I don’t know where. I recall it being somewhat humorous. I am Miss Rose Lv from China, our factory is making the folding strida bike and folding A bike. The Strida 5.0 “loaded” with all of the extras noted above, weighs just slightly less than 20 pounds. I own one, and ride it all over, taking it folded up on the subways etc. can anyone tell me where i can get them? Do anyone now how this strida is compared to Schwinn or Kent folding bikes. I kind of like the design on this folding bike, you can be sure to get some looks when you’re using this bike. Haven’t seen this design anywhere else. Bought one for my missus. Absolutely fab. I looked at loads of folding bikes and nearly all reviews said buy a Brompton. Sooooo glad I didn’t. All those gears, oily chain and a more complex folding system – and more expensive !